After early interest in fashion design Fran chanced upon her career as a scuptural glass blower after a visit to the National Glass Centre in Sunderland. 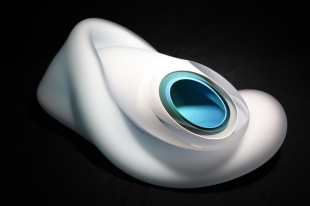 Having recently completed her MA in Glass at the University of Sunderland, Fran has had early success, winning the Charles Bray Glass Prize and the Ashbourne Glass Prize in 2006. She continued her success showing work in London and New York in 2007 and 2008. Fran says ”I make free-blown sculptural vessels and all my work is strongly influenced by my experiences. The beautiful blues and whites of the Canadian glaciers inspired the Ice Series, whilst Gem Series reflects my interest in geodes and crystals. Each vessel is very tactile and the clarity of the glass reacts with the changing light.